ArtsEmerson Presents Denis O’Hare In "An Iliad"
The third season of international theater programming continues at ArtsEmerson: The World On Stage with the Homer's Coat production of "An Iliad" from April 27 – May 4 at The Paramount Center Mainstage, 559 Washington Street in Boston’s Theatre District. This one-man stage retelling of Homer’s epic poem stars Denis O’Hare, who plays Russell Edgington on the HBO hit series "True Blood." Visionary theater artists Lisa Peterson and Denis O’Hare (at left) -- Co-Artistic Directors of Homer's Coat -- have crafted a sprawling yarn in their Obie Award-winning collaboration that begs the question: Has anything really changed since the Trojan War? "An Iliad" spins the familiar tale of gods and goddesses, undying love and endless battles told through the eyes of a single narrator, whose enigmatic experience of the war reverberates with today’s headlines. Peterson's acclaimed, cutting edge work as a theater director here combines with O'Hare's inimitable range as an actor to create a tour-de-force performance of this sweeping account of humanity’s unshakable attraction to violence, destruction and chaos. 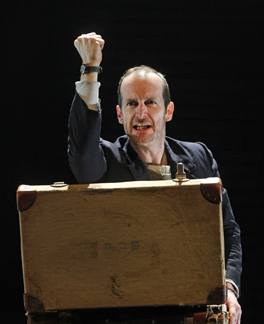 Denis O’Hare won the 2005 Drama Desk Award for Best Featured Actor in a Musical for his performance in "Sweet Charity." His Broadway credits include "Assassins," "Take Me Out," "Major Barbara" and "Cabaret." He has also appeared in numerous productions Off-Broadway and in London. His television credits include a starring role in HBO’s award-winning "True Blood," and FX’s acclaimed first season of "American Horror Story." Lisa Peterson has won Obie and Dramalogue Awards for her directing work, including productions on and Off-Broadway and at regional theaters. She is a member of Ensemble Studio Theatre and the Drama Department, and currently Resident Director at the Mark Taper Forum in Los Angeles. For tickets and information, visit the box office, call 617-824-8400 or visit www.artsemerson.org.